Hello. My name is Sally Boast, otherwise known as the SwirlyQueen. I specialise in bespoke handmade dog harnesses, leads and collars. These are made by me, by hand, from my cottage studio in Woodbridge, England. I started making harnesses for my own dogs, (pugs Bunty & Django) after failing to find the fit, style and quality I wanted. I quit my job to concentrate 'full-time' on developing my little business SwirlyQueen Designs, after realising that dog owners want a unique, bespoke harness, lead, or collar, and are prepared to pay for the time and materials used to create such special pieces. I've been stitching and knitting since my mum taught me at the age of four and I've always had a fascination for designing and making things in miniature; creating a whole wardrobe for my dolls before I turned eight - I've still got the wardrobe safely stored in the loft. My unique designs started to be noticed by other dog owners. I started designing and making harnesses, leads and collars on a commission basis as my reputation grew via social media. 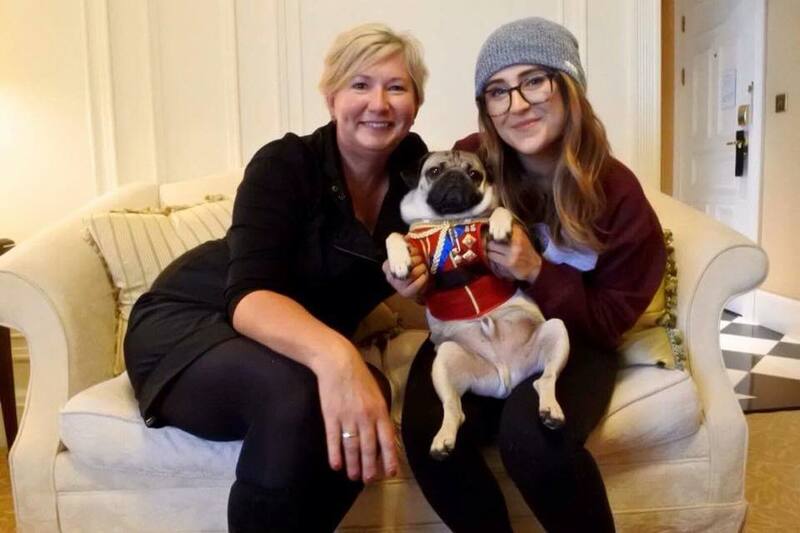 In October 2016, I made a bespoke harness, lead, walkies 'bag' and robe for celebrity pug 'Doug the Pug' for his first visit to the UK. Doug wore his ensemble throughout his book launch tour and was featured wearing it on the popular UK TV show 'This Morning' and in the 'London Evening Standard' newspaper. I insist on using top quality components in all my commissions. All D rings used are welded and my harnesses are both stylish and strong. My signature pieces have gained a loyal customer base - military and royalty themed harnesses are especially popular. I'm always looking for new design challenges and pride myself on the pledge that "no two harnesses will be the same". If you are looking for a custom fit, bespoke, unique, stylish dog harness, lead or collar for the dog you love, you have come to the right place.